As great as the Golden Mall food court is, it’s not for everyone; it’s crowded, loud, cramped and the hygiene is somewhat questionable. So, for those of you that want to experience the great food from Xi'an Famous Foods, but require a more civilized environment, I present to you, Biang! It is a full service, sit down restaurant complete with real plates and silverware. 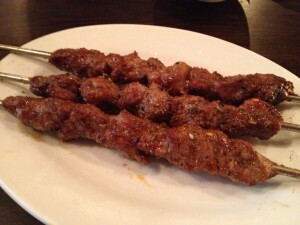 From the “Skewer” section of the menu, we had the spicy & tingly squid ($4.5) and the spicy cumin lamb ($4.5). Luckily for us, the skewers come 3 per order. I have no idea what was so tingly about the squid, but I thought it was tender and delicious. The lamb was excellent as well; the smoky cumin flavor permeated the tender meat. They also offer chicken heart and chicken gizzard skewers, both of which I would have loved to try, but got vetoed by my dining companions. 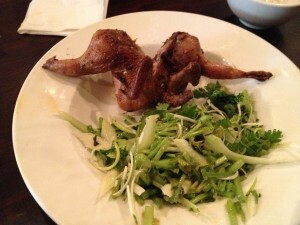 The marinated grilled quail ($6) was underwhelming. It was like a small, inconvenient-to-eat chicken. 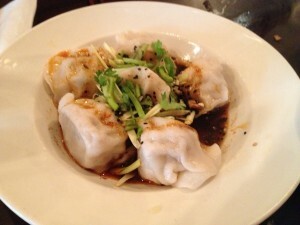 The spicy & sour lamb dumplings ($5) were more spicy than sour, but still tasty. 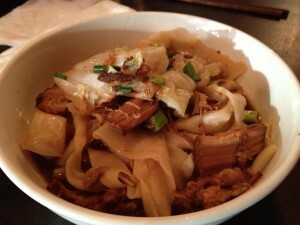 My favorite dish of the night was the stewed pork Biang-Biang Noodles ($6.5) - wide hand-ripped noodles tossed with chucks of pulled pork belly. At $6.50, it is a terrific value. The service was friendly but scattered. Biang! is unbelievably affordable and an excellent place to take your friends that aren’t as adventurous as you are.